Something about our latest project has me experiencing 90s flashbacks. I’ve realized Robert and I are architecture addicts. There are so many ways we’ve made our builder grade house less boring, but the projects with architectural details we’re constantly adding are my favorite. It all began with our faux fireplace last summer. Then, our factory window shower doors. We’re still determined to continue the chunky farmhouse window molding on the rest of our windows. And now this. 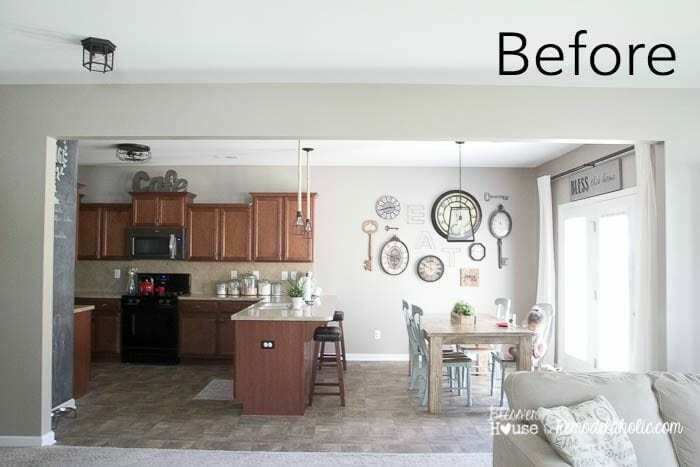 We’ve come a long way in our living room and breakfast area since Day 1 (and there’s still lots more on the wish list), but the doorway between these two spaces was lacking the character we craved. 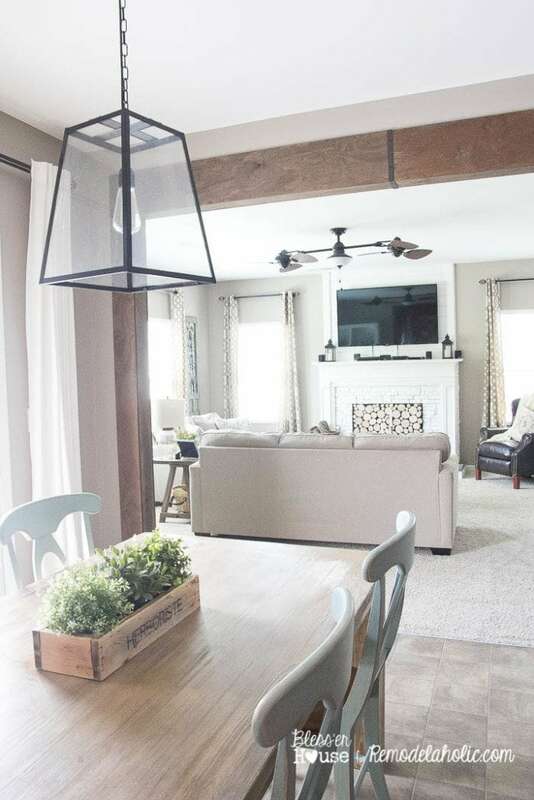 The only problem was a real reclaimed wooden beam would cost $1,000 or more. So after using a few tricks of our own in 3 days and with $80, we turned our plain doorway into a statement-making focal point. I’m so excited how this DIY wood beam doorway turned out! And even though it was a bit time consuming, it was really fairly simple. The full tutorial is over on Remodelaholic. Now that the beam is up, I’m ready to ditch those cherry wood cabinets even more. The back of our sofa staring at me all the time makes me want to build a console table behind it too. But we’ll get there. There always seems to be a project to do, but it’s nice to take a step back and admire how far we’ve come. If you’ve got a plain doorway needing some lovin’ in your house too, you can check out all the details here. What do you think? Are we getting somewhere on this modern farmhouse journey? 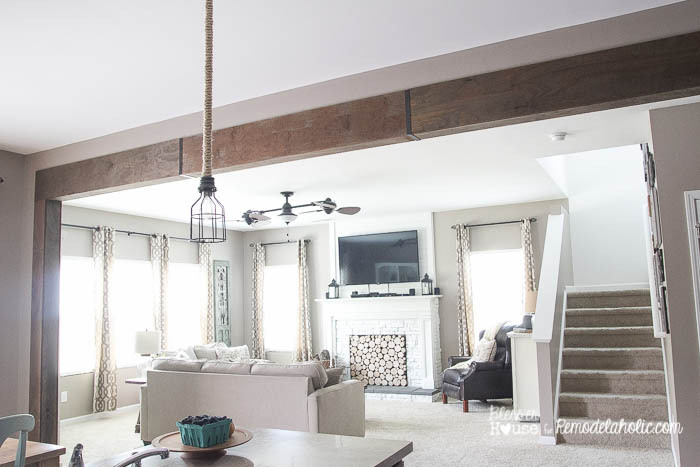 Would you put a wooden beam in your own house? That looks fantastic! What an amazing transformation! We have several of those boring doorways that I’ve been itching to upgrade. I just need the kiddos to go back to school first. All crafting/DIY has come to a halt here in favor of more pool time. Not a bad exchange, but your beautiful project has me inspired to get back to my projects. Great work! The struggle is real! Haha I know how that is. If we had more than one kid to wrangle, there’s no way we could manage all of these projects. We’re so excited how this one turned out though. Beautiful! I am go try this. Your dining chairs were my favorite, but I think this is my favorite now. Aw thanks, Sherry! Believe it or not, this beam was less work than those chairs. Ayayay! That looks amazing Lauren! Definitely adds to the space! Thanks, Chandra! It’s made a huge transformation around here. I LOVE the beam, it’s gorgeous. You guys did a great job. Hopping over to read the tutorial now! Thanks, Leigh Anne! We’re so excited how it turned out. 🙂 Miss ya girl! Thanks, Lanita! Yeah, the back of the couch there bugs me. When the perfect piece comes along, I’ll know it. A thrift store trip might need to happen soon. I love the wood beam and all your other stuff. I just noticed your ceiling fan in the living room. Do you remember where you got it? I am looking for a replacement and I really like that one. Thanks, Joy! Our ceiling fan is called Twin Breeze by Harbor Breeze. 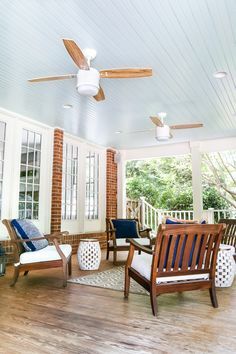 I just wrote a post about it and a few other favorite fans of mine: https://www.blesserhouse.com/2015/07/10-stylish-non-boring-ceiling-fans.html I get questions about it a lot. This is awesome!! I love the look! 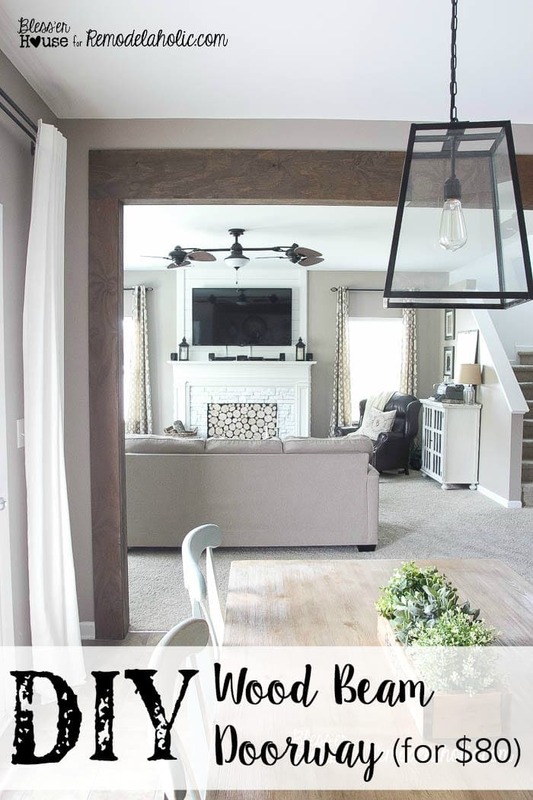 Also love your light fixtures and the gallery wall in your eating area! Lauren, very cool! We have a very similar opening between the living room and dinette area. I really want to try this out. It adds so much character. Great job girlfriend. Thanks, Michelle! We’re so happy with it! If you do try it out, I’d love to see it. Thanks for the excellent idea! We trimmed our opening in our last house out with white trim, but the natural is gorgeous. I’ve got an opening that needs trimming now and maybe we’ll do this! Thanks! This is amazing Lauren! I will definitely be doing this in our house! Thank you so much for the inspiration. Yay! I’d love to see a pic if you do try it! It really was fairly easy. Beautiful, what a difference that makes! Thanks, Carol! It really has transformed our entire downstairs. You are my DIY hero! Love it!! 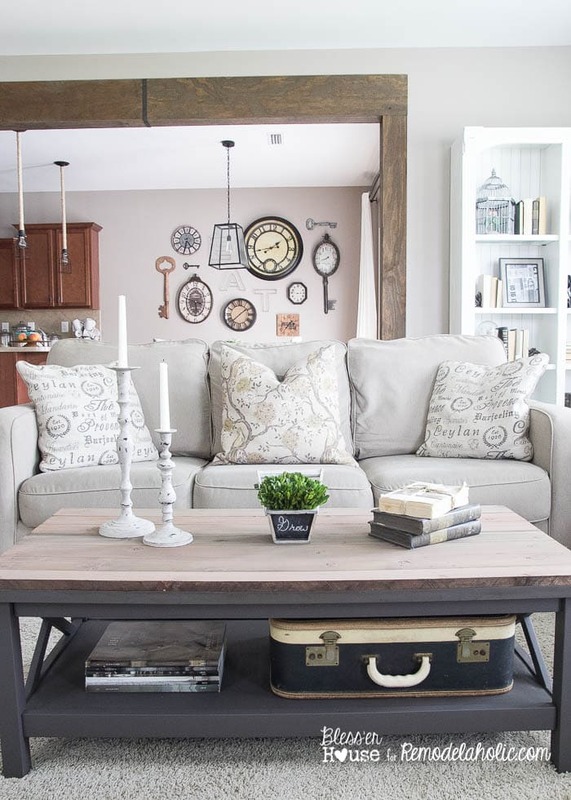 That looks amazing and it adds so much character to your home. Great job! Thanks, Paula! We’re so excited about it. By the way, did you get to pick up your chair at Haven? Oh. My. Gosh. I love this! Such a great way to dress up something that often goes overlooked. Definitely sharing with my hubby to see if we can do something similar in our house! Thanks so much, CoCo! It was so great meeting you too! I’m loving your new bedroom makeover. 🙂 You’ve got mad skills too, friend! This has been on my to-do list forever!! LOVE IT. Tickled silly that you linked up to Inspiration2 this week. HUGS! Yay! Thank you, Kelly! We really love it too. I’m the worst at remembering to do link parties each week, but I always enjoy checking out all of the fun on yours. 🙂 Hugs back at ya! That looks great, Lauren, and is a really good way to add some texture and architectural interest to an otherwise plain opening. Wow adding this bit of architectural accent really does create a wonderful accent to your lovely home. I invite you to share your post at my Thursday Blog hop ( you can still link up until midnight tonight) Hugs! Looks great Lauren! If I wasn’t about to install a sliding barn door on a similar opening I might do just this. 🙂 I’m loving the light over your table – it’s similar to what I’m looking to put in my office. Can you tell me where you got it so I can see if there’s a larger one available? Thanks, Jenna! 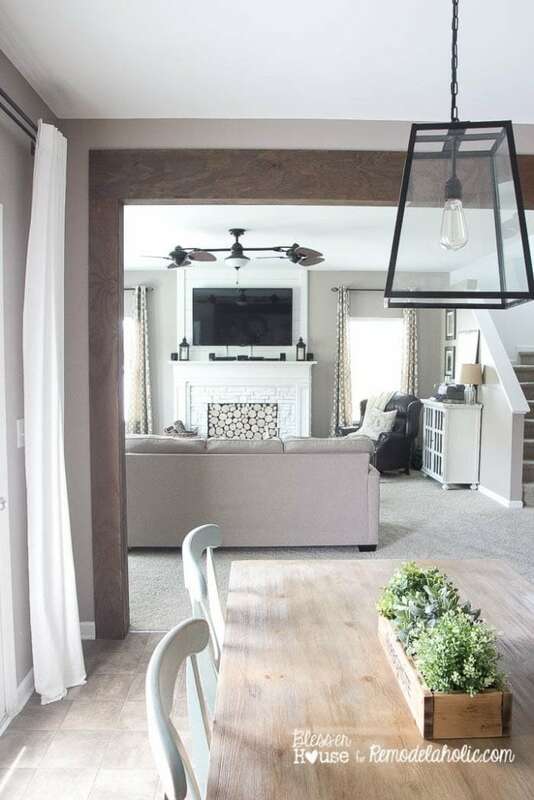 We’re wanting some sliding barn doors in other places of our house too. You’re so lucky to get one! The light over our table is from World Market. I think they only have that one size though. 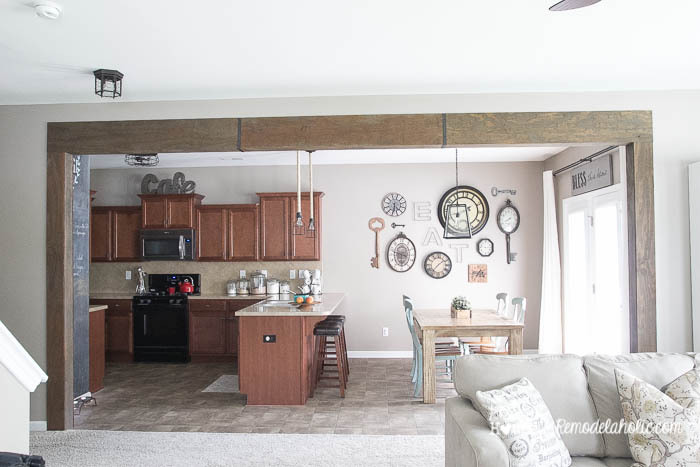 Love the wood beam and your clock and key wall in the kitchen. You’ll get to those cabinets eventually. Seems like every time I finish a project I add three more to my list! 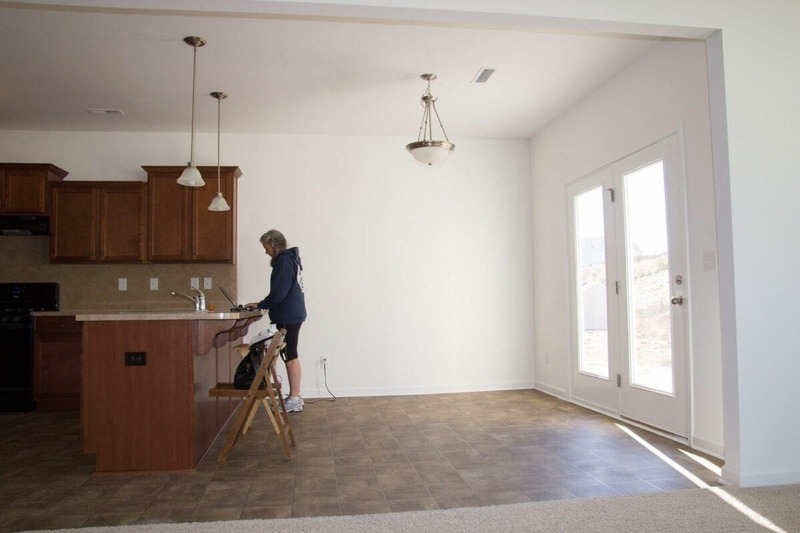 We have an opening very similar from kitchen to great room…always thought about trimming it out. This looks great! Yay! Hope this can come in handy then! Thanks, Tamara! Oh my gosh …I just noticed you have a new chandelier over table. I started to make a rope chandelier like your old one a year ago and then we moved and I didn’t get it finished and it is sitting in storage waiting for me. But now I’m in love with your new chandelier. What is a girl to do??? LOL!